Poverty in the developing world can seem utterly intractable -- such a big problem, and so hard to address, that it’s not even worth trying. But a new report from the World Bank suggests there’s been major progress in one critical area, even though it comes with an important asterisk about women’s improvement relative to men’s. The focus of the report is access to banking -- specifically, ownership of some kind of account for depositing money and making withdrawals. If you don’t follow development issues, that might seem like a strange statistic to study. It isn’t. Banking is a marker for prosperity, since people don’t need it until they have some money in the first place. Perhaps more important, banking is also a source of prosperity -- and the benefits that go with it -- because of what it allows people to do. People who have access to personal banking accounts can start saving, making it possible to build up reserves for life-changing emergencies and to control spending over time. (Economists call this “smoothing consumption.”) In addition, banking allows people to make financial transactions more quickly and simply -- particularly nowadays, when electronic payments are possible. Banking also gives people opportunities to get credit, so that they can finance homes and start businesses. These things matter all over the world, but they'e particularly important in the developing world -- where, for one thing, people are heavily dependent upon agriculture in order to make a living. Without formal mechanisms for saving, it’s difficult to finance purchases of next year’s seed or to survive a bad harvest. Security is another issue, in more senses than one. In many developing countries, the alternatives to saving money in a bank account are investing in goods like livestock, whose value can plummet unexpectedly, or jewelry, which is an easy target for theft. Or there’s sticking it under the mattress, which is even less safe. For these reasons and others, having access to bank accounts can allow people to achieve financial stability and, over time, accumulate wealth. Multiple studies have shown that when people get access to financial services, they are more likely to get formal education, to have good nutrition and remain in good health, and to show other signs of well-being. “Access to financial services can play a critical role in reducing poverty when accounts offer a safe, convenient, and affordable way to save and make and receive payments,” says Leora Klapper, lead economist for the World Bank’s Development Research Group. But how many people already have accounts? And, more important, how many don’t? Until recently, nobody could say with much precision or detail. The only data available was from central banks, which couldn’t provide a whole lot of information about the people using accounts. That changed a few years ago, when the World Bank commissioned its first-ever worldwide survey of banking -- and turned to a trusted polling organization, Gallup, to conduct the study. Those results, based on 2011 polling, came out in 2012. Now, three years later, the World Bank is publishing a follow-up study, based on a sample of 150,000 people across 140 countries. The new data provides a snapshot of the progress that’s taken place during that time period -- and, in many respects, it’s been substantial. Among countries with developing economies, ownership increased from 41 percent of the population in 2011 to 54 percent of the population in 2014 -- which means the benefits of banking are spreading quickly, even though there’s still a lot of room to grow. “Formal savings has positive causal effects on household development outcomes, and the report says the number of unbanked has fallen by half a billion, so this implies that many additional people are probably doing better as a result,” says Dean Yang, an economist at the University of Michigan whose own research has shown how access to savings mechanisms improves outcomes. What explains the progress? Mobile technology is the most obvious factor. Particularly in the rural areas of sub-Saharan Africa and other developing areas, formal banks are still relatively rare. But mobile phones have become nearly ubiquitous -- and mobile phone companies have started offering primitive checking accounts of their own. These accounts don’t offer interest; instead, they charge fees. But the fees tend to be low and the systems themselves are easy to use. Frequently they allow transactions by simple text message. Another boost for account ownership has come from public policy -- specifically, governments deciding to make payments electronically to public sector employees and public assistance recipients. Digital banking has particular appeal for reform-minded leaders in these countries, because it can dramatically reduce the incidence of “leakage” (payments going to the wrong people) and outright corruption. Improving access to banking, particularly mobile banking, has also been a major priority for non-profit organizations that work on development issues. Prominent among them is the Gates Foundation. In this year’s annual letter on the foundation’s agenda, Bill and Melinda Gates said that increasing the use of banking -- and, in particular, mobile banking -- would be one of their top five priorities. But -- as the Gates Foundation letter noted and as the new World Bank data confirmed -- there’s been one very important caveat to the progress on banking: the stubborn persistence of a gender gap. While 65 percent of men worldwide owned bank accounts as of 2014, just 58 percent of women did. 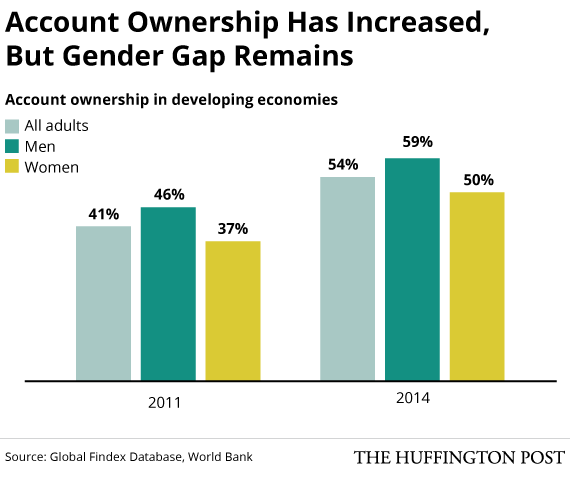 That’s a difference of 7 percentage points, which is what it was three years ago, although the proportions of account ownership for both genders was lower back then. That disparity, in turn, masks a lot of variation. It’s actually smaller in China, but substantially larger in parts of the developing world. Among developing economies in South Asia, for example, 55 percent of men had accounts in 2014 but just 37 percent of women did -- a discrepancy of 18 percentage points. In the Middle East and sub-Saharan Africa, the difference is around 10 percentage points. Access to banking can be particularly important for women, both because it allows them to establish autonomy and because, with control of money, they tend to make decisions that are better for families. Studies have shown, for example, that in developing countries, families are more likely to have nutritious meals when women have at least some direct say over how to spend household money. Without banking accounts, women have no secure place to put any money they make. As a result, they frequently end up giving money over to men with whom they live -- or to family members who might want it for their own purposes. Of course, simply having an account isn’t the same as using it -- and, as the World Bank notes, many people with accounts still don’t use them on a routine basis. That’s why a major focus of organizations like the World Bank and Gates, as well as officials interested in reform, is to change behavior -- rather than simply making sure people have accounts.